Potent, climate-warming gases are being emitted into the atmosphere but are not being recorded in official inventories, a BBC investigation has found. Among the key provisions of the Paris climate deal, signed by 195 countries in December 2015, is the requirement that every country, rich or poor, has to submit an inventory of its greenhouse-gas emissions every two years. Under UN rules, most countries produce "bottom-up" records, based on how many car journeys are made or how much energy is used for heating homes and offices. But air-sampling programmes that record actual levels of gases, such as those run by the UK and Switzerland, sometimes reveal errors and omissions. Now the scientists, at the Jungfraujoch Swiss air monitoring station, have told the BBC the gas is still going into the atmosphere. "Our estimate for this location in Italy is about 60-80 tonnes of this substance being emitted every year. Then we can compare this with the Italian emission inventory, and that is quite interesting because the official inventory says below 10 tonnes or in the region of two to three tonnes," said Dr Stefan Reimann, from the Swiss Federal Laboratories for Materials Science and Technology. "They actually say it is happening, but they don’t think it is happening as much as we see. "Just to put it into perspective, this greenhouse gas is thousands of times stronger than CO2. "So, that would be like an Italian town of 80,000 inhabitants not emitting any CO2." "That is something that shouldn’t be there. "There is actually no Chinese inventory for these gases, as they are banned and industry shouldn’t be releasing them anymore." "I was working in China in 2007," said Dr Angel Hsu, from Yale University. "I would include a citation and statistics that made this claim of China’s position as the number one emitter – these were just stricken out, and I was told the Chinese government doesn’t yet recognise this particular statistic so we are not going to include it." 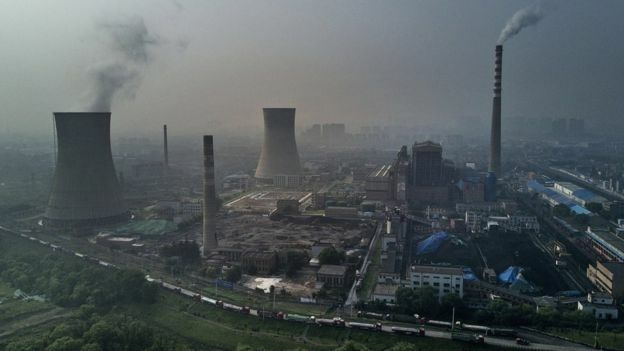 The BBC investigation also discovered vast uncertainties in carbon emissions inventories, particularly in developing countries. 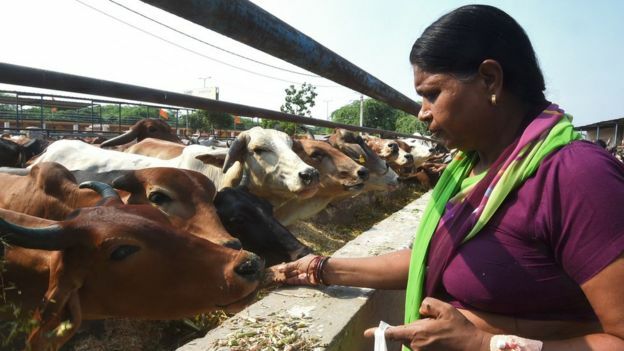 "What they note is that methane emissions are about 50% uncertain for categories like ruminants, so what this means is that the emissions they submit could be plus or minus 50% of what’s been submitted," said Dr Anita Ganesan, from the University of Bristol, who has overseen air monitoring research in the country. "For nitrous oxide, that’s 100%." There are similar uncertainties with methane emissions in Russia, of between 30-40%, according to scientists who work there. "What we’re worried about is what the planet experiences, never mind what the statistics are," said Prof Euan Nisbet, from Royal Holloway, University of London. "In the air, we see methane going up. The warming impact from that methane is enough to derail Paris." But Prof Glen Peters, from the Centre for International Climate Research, in Oslo, said: "The core part of Paris [is] the global stock-takes which are going to happen every five years, and after the stock-takes countries are meant to raise their ambition, but if you can’t track progress sufficiently, which is the whole point of these stock-takes, you basically can’t do anything. "So, without good data as a basis, Paris essentially collapses. It just becomes a talkfest without much progress." Matt McGrath seems genuinely surprised that we cannot trust numbers coming out of the likes of China and India. What planet is he living on? Does he not realise that, while Britain and a few others obsess about global warming, the rest of the world have got much better things to do with their time and money? As always they witter on about tiny amounts of gases which are “thousands of times more warming than CO2”. What they never say is that the claimed effect of these gases is measured in isolation whereas the real impact, if any, will depend on how they react in the real atmosphere. I have read, for example, that the absorption spectrum of methane overlaps very largely with that of water vapour so the effect of the methane is very limited as it is completely swamped by water vapour..
Maybe the story is similar for some of the other gases mentioned. CO2 emissions are theoretical anyway. Do they expect us to think that some agency in every country is measuring the CO2 emitted from every process, including transport. I don’t think they include breathing out by individuals, which gives China and India a head start anyway. Funny how the climate doesn’t seem to have noticed these extra emissions. The key to this scam, designed to curb global warming, is a scheme known as the Clean Development Mechanism (CDM), set up under the 1997 Kyoto Protocol and administered by the UN. It enables firms and governments in the developed world to buy “credits” which allow them to continue emitting greenhouse gases. These are sold to them, through well-rewarded brokers, from firms in developing countries that can show they have nominally reduced their emissions. Easily the largest and most lucrative component in the CDM market is a peculiar racket centred on the manufacture of CFCs, chlorofluorocarbons, classified under Kyoto as greenhouse gases vastly more damaging than carbon dioxide. 11,700 x Zero = Zero. Inscrutable orientals. Let’s wind the western muppets up by agreeing with all their nonsense, then hold them to ransom with nothing. For various reasons, the ozone hole has not healed much – yet. When and if it does, his theory will get a test. Were Prodessor Lu then proved right, it woukd mean ‘global warming’ will have been ‘solved’ – entirely by accident! The problem with Prof. Lu’s theory is that if the original article is right and there are tons of unrecorded CFC’s being released into the atmosphere, his calculations will be trashed. Insignificant. The inventory in the stratosphere is measured in tens of millions of tons. The accumulated stock of the past is assumed to be disappearing at a rate of 1% per year. Obviously, unwinding of the putative effect will take a while. The main objective of this junk news is to keep people worrying about “Climate change” and pressurise the governments. There is not a verifiable or meaningful fact in the article, but it gets headlines, WHY, WHY, WHY???? More BBC fake news. I always used to think that it was the sun that warmed the climate, not some potent gases. Where can I get some of these gases to warm my house next winter? The BBC should be delivering real programmes, not wasting license fee payers’ money on Counting Carbon nonsense. What carbon will they be counting? Graphite, diamonds, graphene? It’s all a load of Buckyballs! I am reminded of my last employer where figures on CO2 emissions from an ‘afterburner’ were demanded. Said afterburner was incinerating solvent emissions from the factory and only a calculated figure was given. The engineer led the public servant to the incinerator located at the base of the 40metre stack and pointed up the steps circling ithe stack to a sample point roughly 25 metres up. HIs comment was “go and measure them yourself. And be careful as the base of the stack is 170℃”. The quoted figures were accepted. The implication within the BBC programme was that greenhouse gas levels are higher than reported. This is interesting since, one would expect, the world should be hotter than the global warming models predict, which of course it isn’t. So these models are even worse than we thought! I had to smile at dear Prof Peters’ comment: Doesn’t he realise the Paris agreement is about money not data. Omitted from the BBC report was any mention of the temperature of planet Earth. Simply mentioning “thousands of times worse than CO2” does the job for them. It’s all frightfully scary isn’t it? But surely, if emissions are much greater than hitherto reported, and yet Earth’s temperature resolutely resists rising at all, never mind dangerously, does this not suggest that the Billions spent on super-computers is more wasteful than hitherto reported, and the computer modeling is even more out of kilter than hitherto reported? The Beeb has hours of newscasts to fill, and Parliament is in recess; one has to fill the time with something doesn’t one? Or one will be out of a job. One is beginning to find all this increasingly tiresome, isn’t one? Mr Fuller made the same observation as I was writing the same thing. We are as one! And somehow we know that is all the they’ve wanted. It’s not about the atmosphere but about emotions, virtue signaling, keeping big government in control by infantilizing the new generation, but mostly its about making a swift buck. August 27th, 2014 by Roy W. Spencer, Ph. D.
Scary-sounding double nothing burger with a side portion of pant-wetting BBC hysteria. Not more printed bbc manure to be thrown into ye olde global alarmist muck spreader?! Hmm, all in the hope that some of it sticks. But then, as the cr*9 flies fast out of the ‘krud diffuser’ machine it is too weak to be noticeable, most of it indeed is hot air – total verbal diarrhoea – no change there then. This is actually quite an admission by the BBC. Most countries have agreed to reduce their emissions sometime, but there are no laid down standards for measuring emissions and no independent audits of the emissions estimates. Like with the surface temperature data, there will no doubt be very good reasons in peer-reviewed journals for deviating slightly from any guidelines, which will get the desired results for countries. Like with EU regulations, it will only be Britain who will stick to objectivity. Was Carbon tetrachloride ever used as a refrigerant? It was certainly used in small portable fire extinguishers in the 60s and 70s. I don’t understand how these specific claims about “thousands of times more harmful (as greenhouse gases) than CO2” can be made when the mechanism of CFCs in the atmosphere is totally different from CO2. The latter is non-reactive and merely acts (or not) as a blanket whereas CFCs react chemically with the ozone component of the atmosphere, undoubtedly destructively. But does the latter cause warming or just an increase in UV radiation?